Back in the mid-60s when I watched cousins Billy Hensley and Jimmy Hensley battle our local Richmond drivers at Southside Speedway in the potent NASCAR Modifieds fielded by Hubert Hensley, I had no idea that all three along with recent NASCAR crew chief, Jeff Hensley have something in common with NASCAR patriarch, "Big Bill" France. Although Ridgeway is an oft used address, the Hensley clan of Virginia racers hails from the small burgh of Horse Pasture, Virginia, in Henry County, 7 miles from Martinsville and 21 miles from the Wood Brothers' home in Stuart. 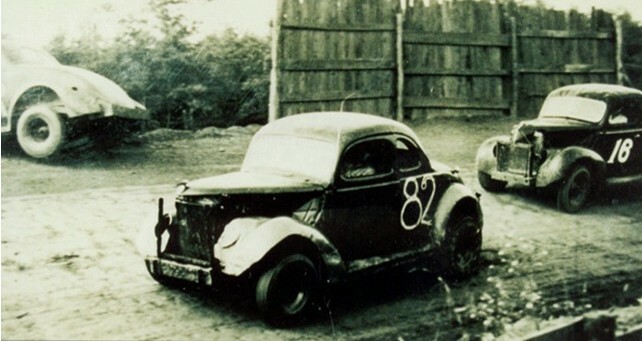 While most are familiar with the story of Bill France leaving Washington, DC and relocating in Daytona Beach, turns out Big Bill was also born in Horse Pasture, Virginia - on September 26, 1909. At the time, his father worked in a law office in "downtown" Martinsville. Maybe all you folks already knew this, but I didn't. Makes Big Bill's fondness for Martinsville and the Greensboro, NC area all the more understandable to me. Glen Wood in #16 at Horse Pasture, Virginia's Morris Speedway in this uncredited photo posted by Andy Towler in 2010. This same photo appears in Brian Katen's book, FULL THROTTLE that chronicles the history of auto racing in the Commonwealth of Virginia.